Enterprise Fitness really began the first time Mark competed and came last at a bodybuilding competition. He did everything you could do wrong to achieve what any bodybuilder aims for – optimal body composition and health. His results weren’t from a lack of trying or discipline. He just didn’t get the results. This broke him. He’d invested so much into the way he looked. To come last and look way out of place on a bodybuilding stage ignited something in him. Some people give up after events like this. Call it Italian stubbornness, but he never considered giving up. He wanted to learn why the advice he followed was wrong, find answers and share those answers with as many people as possible. That was 2004. A kid with a dream to one day have his own personal training studio and be a leader in the fitness industry. 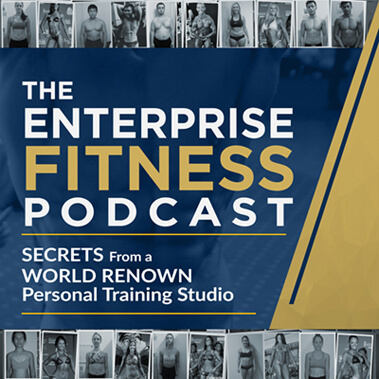 Out of his pain of being the fat kid at school and the one who looked out of place on stage came Mark’s eagerness to learn and be masterful at transforming peoples bodies and ultimately their lives. That’s why it’s hard to give a title to what Mark and Enterprise do. It’s so much more than personal training. It has to be. When Mark started his career as a personal trainer in 2006, his dream was to create the most professional and education-driven personal training studio in Australia, as it is education that leads to lasting results. After having a bad experience competing in a bodybuilding comp, Mark was hungry for knowledge. He didn’t want anyone else to make the same mistakes that he did. So he started training competitors, many who went on to win their competitions and even Ms Australia and Ms Olympia titles. This lead to more competitors reaching out to train with him. But Enterprise never started with the vision of just training competitors. The truth is, early in his career, Mark did everything he could to not be labelled as a ‘contest prep coach’ as he felt he had more to offer. But as his success with competitors grew, so did his demand. Overseas and international requests came fast and furious. Mark’s reputation as the go-to guy for getting great results grew. After years and years of Mark being known as “Maximus Mark”, he realised he had to get serious about building a personal training studio. So he created a new entity a banner to train people under, Enterprise Fitness. After making this decision, it was about 18 months until he found the right location in Richmond. The Enterprise studio was fixed up and painted. And on the 18th of March 2013, Enterprise finally opened its doors for its members. With its own personal training studio, more members and trainers joined. More gym equipment was added. Enterprise was growing – fast! And as it grew, so did its services, education and results. Master and Senior level trainers were introduced. The Wall of Fame expanded (and still is!). Even an admin team and reception had to be established to handle the ever-growing flow of new sign-ups. Guest speakers from all over the world flew in to share their knowledge and deliver world-class education. Enterprise was a dream that Mark Ottobre turned into a reality. His vision was taking shape – to raise the standard of personal training globally, with a world class personal training studio that offers education to those hungry for knowledge. It has been more than ten years after Mark started as a solo PT, but the road to success wasn’t always easy. The phenomenal growth of Enterprise wasn’t by chance. Nor is it shocking or astounding. Because shocking things are unexpected – they are unplanned miracles. The growth of Enterprise was boring. It was plain old boring work that had to be done day in and day out. It was hard work, consistency, careful planning and the burning desire and vision of someone who was just too stupid quit. When the studio had to be renovated, Mark helped paint the walls and lay the floor. When people joined Enterprise, Mark challenged their beliefs and values so they could change their lives. At the end of the day, Mark built Enterprise Fitness to be a personal training studio where you will want to train in. How can we be so sure about this? Because it’s a place he built with love, the perfect place to practice the art of personal training. A personal training studio built by a personal trainer obsessed with personal training. A studio that has had years of head-turning results. We turn your fitness goals into reality. Maybe you’re starting at 30% body fat and want to lose 10-15 kilos. Or maybe you’re starting at 13% body fat and want to get just a ‘little’ leaner. Or maybe you want to build muscle and get stronger. Wherever you are right now is perfect and we can help you. At Enterprise Fitness, we make your fitness goals a reality by making health and fitness apart of your lifestyle through education. So you don’t have to feel like you’re ‘doing’ anything, because you already are a healthy person. Countless Enterprise members have achieved results they never thought was ever possible, often by doing the opposite of what they thought would ‘work’. We invite you to come and experience the difference in training with bona fide world leaders in the field of fitness. You’re only a phone call away from training with the best. If you would like to book in a time to discuss your fitness goals don’t hesitate to give us a call on 1300 887 143 to make an appointment (and no, this appointment won’t cost you a dime). Just bring yourself and your list of questions! Alternatively, you can email [email protected] or contact us on Facebook (www.facebook.com/enterprisefitnessaustralia.com).